Restaurant: 220. Riverside Terrace: 30. 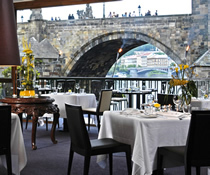 Mlynec Restaurant is set in a stunning location by the Vltava River, in the very centre of Prague, next to and overlooking Charles Bridge. Mlynec presents a wonderfully balanced international menu, employing fresh local and seasonal ingredients wherever possible. Head chef Marek Šáda has worked and trained extensively abroad - his previous position was with Mads Refslund, co-founder of the world renowned NOMA restaurant in Copenhagen. And his flair for taste is amply demonstrated in his innovative dishes. The atmosphere at Mlynec is elegant and sophisticated, with refined service. But waiters will ensure you feel welcome and comfortable, and are not at all overbearing. Outside on the terrace, where you can choose to dine in the warmer months, the view takes your breath away. You are seated right by the magnificent Charles Bridge and the Old Town Bridge Tower. The menu offers an eclectic mix of delightful dishes, well designed to ensure most diners are catered for. Once ordered, you will await your choices with anticipation - and the presentation of the food will not disappoint. The Mlynec wine list includes excellent local Moravian wines alongside some first-rate International bottles. Each item on the À La Carte Menu also comes with a 'recommended wine'. For the ultimate fine dining experience, order one of the set menus, such as the 'Degustation Menu'. Each menu has optional wine pairing for each course. The matching of individual dishes with food is an art form which Mlynec has long perfected. Mlynec Restaurant offers luxury dining in a terrific location. Prices reflect the high quality ingredients employed, but are reasonable enough for many still to find attractive. A fine dining experience not to be missed. Two other best in class restaurants which offer a similar dining experience are: Bellevue Restaurant and V Zatisi Restaurant. A wonderful riverside location, elegant service and the option of large round tables for groups make Mlynec restaurant ideal for special occasions: large family dining, groups of friends, cocktail parties, wedding receptions, and other events. Advance reservations are essential.